Now that Iowa congressman Steve King has finally gone over the brink and defended “white nationalism” and “white supremacy,” Republicans from his own state and nationally are piously denouncing the man, having suddenly discovered that he’s a mite racist-y. King’s probably justified in feeling betrayed by his old friends, particularly those in Iowa who know him well. Maybe he got a bit carried away in forgetting to use code words for “white,” but he’s been renowned during his entire congressional career for being an old-school nativist who isn’t just concerned about “illegal immigration,” but wants restricted immigration generally — at least from nonwhite countries — as a matter of cultural (and by close implication racial) self-defense. That what always distinguished King and his congressional doppelgänger from Colorado, Tom Tancredo (who left the House in 2009 after a long-shot nativist campaign for president). Maybe they talked about the “rule of law” like other opponents of immigration reform, but they were always clear that they considered all non-European immigration as a threat. Indeed, until Donald Trump came on the national political scene, King was for a while all but alone in the fever swamps on this issue. The effort to marginalize the role of racial or religious bigots in cultural conservatism works best when everybody’s got the memo and is refusing to say things that cross the line. But right there in Washington, within close proximity of the cameras, is at least one member of Congress who, to use a phrase sometimes said of Wallace in his heyday, just comes right out and says it: Iowa’s Steve King. Ernst’s senior colleague Chuck Grassley and current Iowa governor Kim Reynolds also came to the nativist’s aid when he faced intraparty opposition. 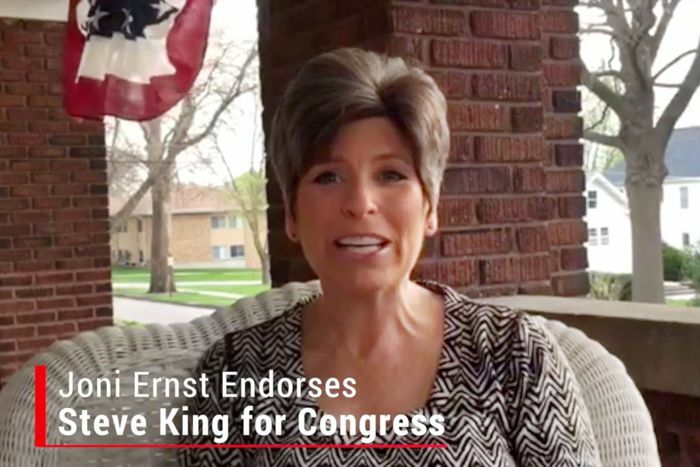 You can almost understand Ernst’s support for King — you know, two whole years before she apparently paid any attention to the implications of his words. He was the odds-on favorite among Iowa Republicans to win the 2014 Senate nomination that ultimately went to Ernst when he demurred. So let’s don’t accept the idea that King was some sort of grudgingly tolerated wild man whom Republicans decided to smack down when his outspokenness got out of hand. They knew who he was, and many of them were happy to promote his obnoxious career until it began to cast an unforgiving light on themselves and their leader in the White House.